Heart's Delight Cards: I Love the Man in Brown! I Love the Man in Brown! Yesterday he brought my box of stamping goodness from Stampin' Up! My pre-order from the Occasions Catalog arrived, and I can't wait to show you some of the lovelies. Well, I can't show you the products (yet) but I CAN show you what I make with them! There are new Framelits used here; the banners and the starburst circle are all new. 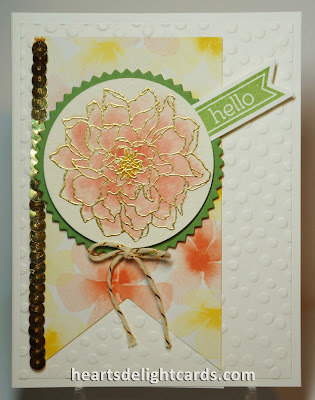 And the blossom is from the gorgeous Peaceful Petals stamp set. I heat embossed it in gold on watercolor paper, then used an Aqua Painter to add Blushing Bride to it. So, ya know how I love me some bling, right? Well there's bling aplenty in the new catalog! The Gold Sequin Trim and Gold Baker's Twine are just two of the fabulous new shiny items. Note: Items in Red are in the new catalog available January 3rd. This is so sparkly and gorgeous! Love that you gold embossed and watercolored that beautiful flower.